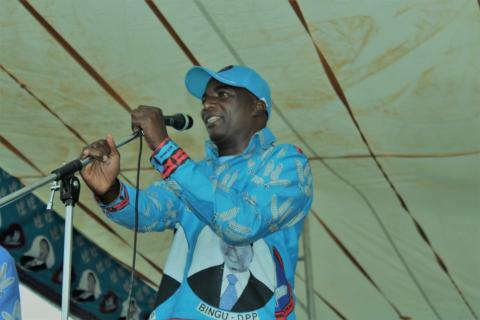 Southern Region governor for the Democratic Progress Party (DPP) took a swipe at opposition parties Malawi Congress Party, Peoples Party and United Transformation Movement, saying they are delusional in thinking that they can topple President Peter Mutharika from power. Mchacha said the two parties are pathetic and urged people in Blantyre not to vote for them in the upcoming May 21 tripartite elections. The governor, who is no stranger to controversy, said this at a rally held by DPP presidential running-mate Everton Chimulirenji in Nancholi on Sunday. He said the DPP-led government is on course of achieving a landslide victory and told people this is not a time for choosing a dark rooster, the MCP insignia. Mchacha’s remarks comes barely a week after the two opposition parties, MCP and PP announced they have formed a coalition. The DPP top brass told the crowd, which gathered at Moneymen Ground, that they are receiving people from different parties on a daily basis at their office who have turned away because they see the wise and dynamic leadership of Peter Mutharika. During the rally, Mchacha paraded a number of people purportedly from the UTM which is led by Vice President Saulos Chilima. “We have come with courage because we know DPP is the one party having strength to win on 21st May. We have come from Blantyre City East which is under Alex Chimwala’s area,” he said amidst chants and ululation from DPP cadets clad in their blue colours.